Balabolka, a word in Russian that can be translated as chatterbox, is an application that belongs to the so-called "text to speech" category that reads any written text, whether sentences captured on the clipboard or saved in a document. To do so it makes use of a TTS (Text-To-Speech) engine that is capable of generating a synthetic voice to read any text. Generation of a natural and intelligible voice to read the texts. 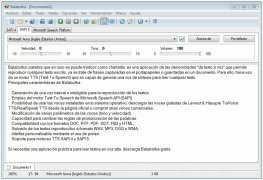 Use of the Microsoft Text-To-Speech engine, Speech API (SAPI). Possibility to use the voices installed on your operating system, download the free Lernout & Hauspie TruVoice TTS/RealSpeak TTS voices from the official website or buy other commercial voices. Modify several of the voice's parameters (tone and speed). Possibility to change the words' pronunciation rules. Compatibility with the DOC, RTF, PDF, ODT, FB2 and HTML formats. 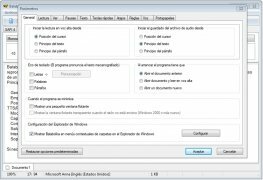 Saving of read texts as WAV, MP3, OGG or WMA. Customizable interface by means of skins. Support for TTS SAPI 4 and SAPI 5 engines. If you need a practical application to read texts out loud, download Balabolka for free. This download requires a ZIP compatible compressor. Works with Windows 2000, Windows XP, Windows 2003, Windows Vista and Windows 7. 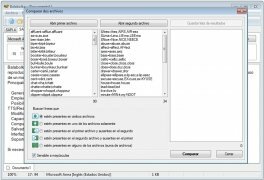 It's necessary to have the Microsoft Speech API (SAPI) engine installed.